Breastfeeding is a very personal and private thing for a mom that elects to do so. Although it is very rewarding, breastfeeding can be a lot of work, messy, painful, time consuming, and sometimes down right exhausting. 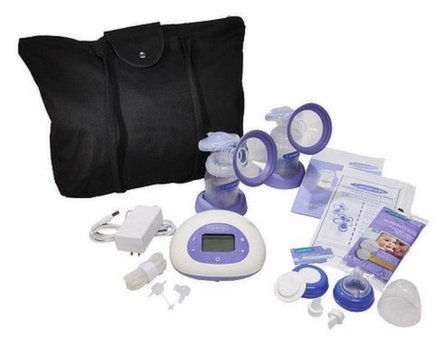 The last thing you want to be doing as a new mom is trying to figure out what kind of breast pump you should purchase! We gave two Lanisoh pumps to two moms and let them tell us how they REALLY felt about it. They really dove in and gave us their honest opinions! Lansinoh’s pump has 3 stages with different pumping levels within each stage, which helps make pumping as comfortable as possible. One of the moms that tried out this pump for us especially liked this feature, because “It helped you get your pumping experience as close to the way that your baby nurses as you can with a pump”. Unlike most pumps the flanges have a silicon rim for comfort which is really nice compared to hard plastic that is more typical to see. Cons: When it comes to this pump, there are a lot more cons than pros. I really wished it worked better for the quality, and high price that it is. ($150 before taxes) Most features of this pump sound nice in theory, but it was really only appealing to the eye. Once you had to start using it, it wasn’t as functional as it could be. The piping is a little difficult to store as it doesn’t wrap up very well since its super flexible. The 5 oz bottle works in most cases, but a slightly larger bottle tends to be necessary when you have older babies. While the silicon around the flanges is nice, the flanges were rather large for a “standard flange”! When I was using the pump I couldn’t get them to stay in place, or get a good suction going. There was a lot of adjusting, a lot of changing settings, and A LOT OF FRUSTRATION. After trying multiple times, and spilling many ounces of liquid gold I gave up. What is the point of pumping if you ended up soaking wet, and bottles are half empty? All of the parts are dishwasher safe, but there are a TON of parts! I don’t think I would have wanted to pump at 3AM having to think about cleaning it!! You know that you are going to get it very clean, but how long is it going to take you? Lansinoh has some fabulous products, but they have some work to do with this pump before I would want to use it again. As a momma I really don’t want to spend so much time pumping. It has to be quick and easy! It’s a good product, just needs some fine-tuning! In the end though, a pump is a very personal item and there really are a lot to choose from! Do your research thoroughly! Previous Hyland’s Homeopathic Halloween Costume Contest!